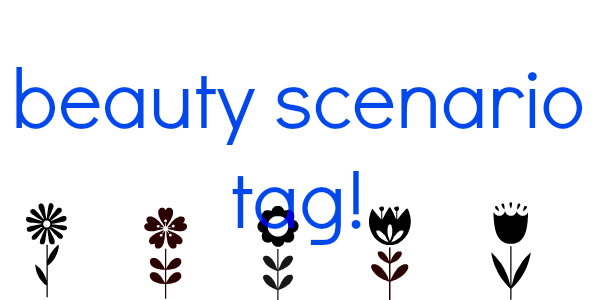 Modern Beauty Girl: Beauty Scenario TAG! 1) You have to get rid of all your foundations and you can only keep one high end and one drugstore, which do you keep? I honestly haven't found a holy grail high end foundation that I've loved yet, but if I had to choose one, I'd probably pick Jouer Matte Moisture Tint. My favorite drugstore foundation is Maybelline Fit Me Liquid Foundation. 2) You go for an interview and the lady interviewing you has lipstick on her teeth. Do you approach the subject or ignore it completely? I would try motioning to the mouth to see if she picks up on the hints, but if she doesn't than I would tell her about it. If I think that if I was the interviewer, I would want to know, so it's only right for me to tell her! 3) You're not feeling yourself and need a pick me up. Which lipstick do you put on to make yourself feel beautiful? A bright red! Something like OCC NSFW or Miranesse Glossy Kiss pencils in 02 Flirty Kiss. I think that a bright red lip can make you feel so beautiful and confident! 4) You go back in time for a day to your teenage years, how would you do your hair and makeup differently? Can't really answer this one because I am still currently in my "teenage years!" 5) You ask your hairdresser for a shoulder length Pixie Lott hair cut, but they hear wrong and give you a pixi cut. Do you a) smile, say thank you, leave and call your mum hysterical b) cry in the chair or c) complain to the manager and demand a refund. I think it depends on how bad the haircut is! If it looks pretty bad, I'll probably talk to the manager or the hairstylest so maybe c? But I'd never demand a refund for a haircut. If it's okay and I could live with it I'd probably choose choice a. 6) Your friend surprises you with a 4 day city break and you have 1 hour to pack. Which 'do it all' palette do you pack? I don't have a good "do it all palette" but I'd probably take my Skylark Snowkissed Cashmere palette because it has lots of dark medium and light colors with some fun colors like a cranberry and navy in it and it also has a shimmery highlight and a brush! 7) Your house has been robbed, but your beauty stash has been raided! What's the product you hope is safe? My makeup brushes! I think that you can buy high end equivalents in the drugstore when you're trying to rebuild a collection, but high end brushes don't really have equivalents in the drugstore for the most part (I know real techniques and eco tools are great!). I just think that the feel of high end brushes are so much better than the drugstore ones I've tried and that it would be devastating if it was gone! 8) Your friend borrows your makeup and returns it in awful condition. Do you a) Just pretend you haven't noticed b) ask them to repurchase it or c) Secretly do the same to some of theirs. I feel like all of these answers are really awkward! I honestly would probably confront them about it in a nice way because the chances are that if they're being quiet about it, they either haven't noticed or are too embarrassed to mention it. But if I had to choose a letter I would choose a. So that was the beauty scenario tag! I tag all of you to do this and I would love to see your answers to this tag! Let me know in the comments if you have any other tags that you'd like me to do and don't forget to follow me on bloglovin! Tarte Lights, Camera, Lashes Review! Dinner Party Outfit of the Night! Semi Formal Dance Outfit of the Night!